Halloween would feel incomplete without a festively spooky jack-o-lantern sitting watch on the balcony or patio of your Springs Apartments home. Whether you're planning a contest entry or a home decoration, use these tips and tricks to carve your pumpkin like a pro. Choose a pumpkin the same way you would select any produce, by looking for one that's bruise- and mold-free. A sturdy stem is a good sign, but avoid lifting the pumpkin by the stem to reduce the risk of damage. Flat bottoms are preferable so the pumpkin will not roll around. Beware of a heavy pumpkin that makes sloshing sounds; that's a good indicator that the pumpkin is rotten inside. Wash the pumpkin with warm, soapy water and dry thoroughly to inhibit the growth of mold. Designs can be created freestyle or by using templates. Either way, use a dry-erase marker so lines are easy to change or remove. Cutting into the bottom instead of the top helps the pumpkin retain moisture so it doesn't dry out quickly. Carve out a pumpkin-shaped piece for easier replacement. Use a large metal spoon or ice cream scoop to remove the guts. Instead of going one scoop at a time, scrape the inner wall in a continuous spiral motion and turn the pumpkin upside-down to release all the innards at once. Carve the pumpkin with a steady sawing motion using straight up-and-down strokes rather than angled ones. Use a long serrated knife such as a bread knife, or you can find inexpensive pumpkin carving sets on Amazon.com. Begin with the details in the center and work outwards to the larger pieces of carving to avoid breakage. If you prefer an all-over design to a single character, cookie cutters make good templates. Use a mallet to work the cutters into the pumpkin for a die-cut effect. 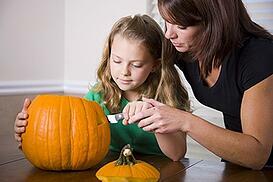 Periodically test your carving by dimming the lights and shining a flashlight into the pumpkin. This shows areas that need better definition. Insert a lit candle for a few moments and carve out a small hole around the scorched area to create a "chimney." A safer choice is to use LEDs, battery-operated tea lights, or one of the other candle-free options in the market today. Apply petroleum jelly or vegetable oil on all the cut edges to keep them from drying out. Extend the life of the pumpkin by spraying it daily with a mixture of bleach and water. If you're not putting the pumpkin out right away, preserve it by wrapping in plastic and storing in the refrigerator. A dash of cinnamon or nutmeg inside makes for a delectable aroma when a candle is burning. If the pumpkin begins to shrivel despite your best efforts, soak it face-down in cold water for several hours to revive it. When it comes to jack-o-lanterns, do you have a favorite theme or character? Tell us in the comments!